In your Americommerce store Admin Console, click Tools > Apps & AddOns > Quickbooks and supply a login and password, then click Enable and then Save. This will be something you create just for AmeriSync to be able to securely access your Americommerce Stores data. Open Quickbooks and load your company file. Then supply your login and password as configured in Americommerce stores . Check Inventory in the grid if you want Quickbooks to control the inventory count. Please make SURE Quickbooks inventory counts are up to date as this will synchronize inventory between Americommerce Stores and Quickbooks. This makes Quickbooks the master inventory place. Click Active to activate the store. Configure your Special Items for Shipping, Discounts, and Non-Mapped Items, Sales Tax Item to items pre-defined in your Quickbooks company file. Rename your Credit Card Types if they do not match your Quickbooks configuration. 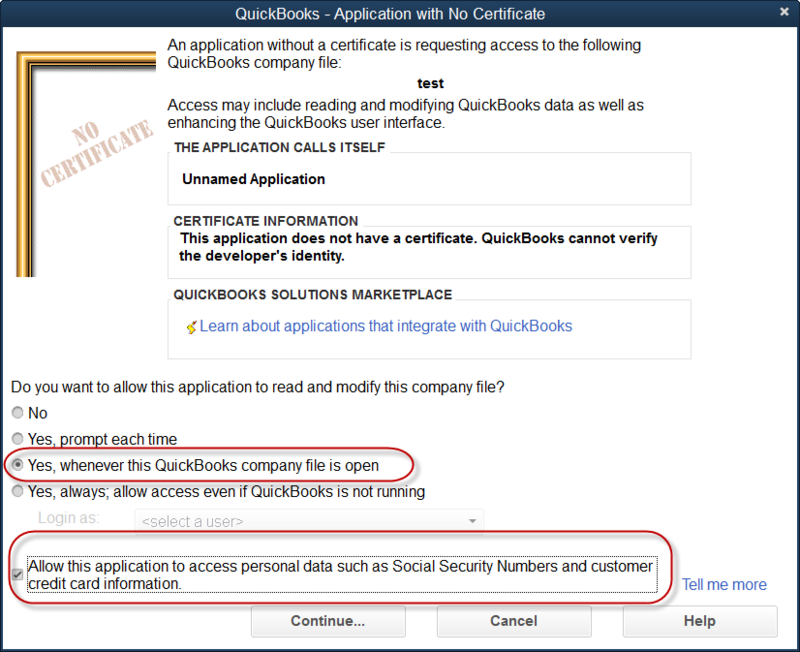 The first time you run AmeriSync, Quickbooks will prompt you to allow AmeriSync to access Quickbooks. Next, decide if you wish to import your new orders as Invoices, Sales Reciepts, or Sales Orders. 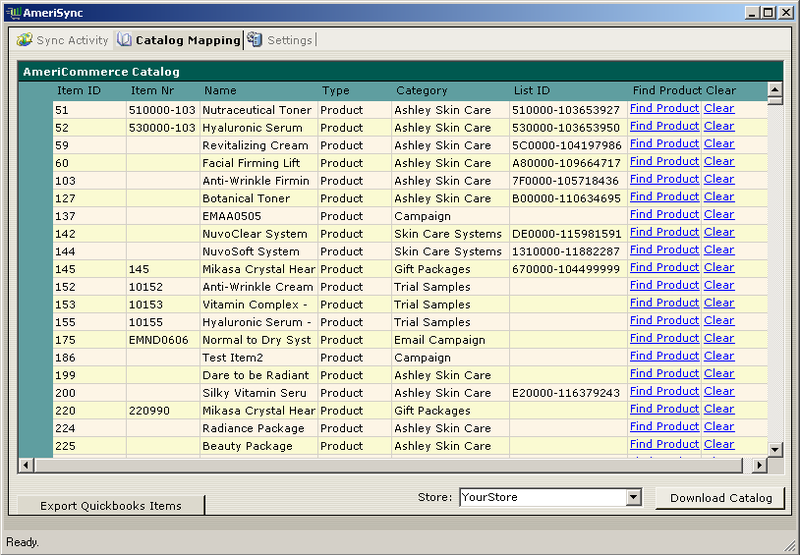 Each item in your catalog will need to be mapped to an item in Quickbooks. Click on the Catalog Mapping tab and then click Download Catalog. Your entire Americommerce catalog will be downloaded to AmeriSync and you can begin mapping your products to Quickbooks products. For a potentially faster method, you can click Export Quickbooks Items, which will create a CSV file that you can combine with a CSV Catalog export from the Americommerce stores Data Export Tool. You can then use Excel to combine to associate your Americommerce items to your Quickbooks items by populating the QBItemID fields on the Americommerce Catalog export file. Once you are finished you can re-import the Americommerce Catalog CSV file back into Americommerce to automatically map your products. Go to the Sync Activity tab and click the Sync with Active Stores button. A log will display in the window showing the activity as it happens. If you have mapped, tested and ready to put this on a schedule, go to the settings screen and under Automatic Sync, check 'Enabled' and put the time interval you would like to sync the data. As long as this service is running, the sync will occur on that interval. This application can be added to your startup for the computer or server it is installed on to ensure it is always running. Amerisync cannot send tax data to Quickbooks. Quickbooks calculates the tax itself. This not a defect or a missing feature. This is by design with Quickbooks. Item Groups do not allow you to specify pricing. We support them, but we can’t set the price. 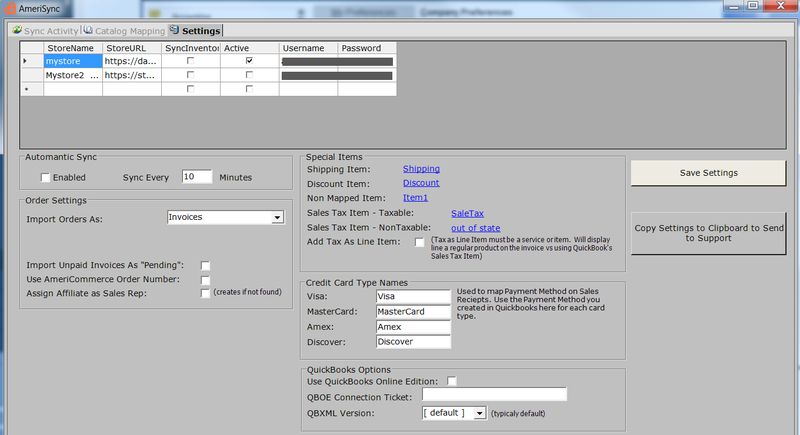 Quickbooks calculates the price based off of the items as they are in QB. This is by design and you cannot even change it if you are entering an order in QB. If this is a feature you need, you'll want to look at inventory assemblies. You add these very similar to how you add Item Groups, however you can specify the cost and pricing and do a lot more reporting on them. Anyone who wants to control pricing on a set of items sold as a single SKU item in Americommerce needs to use Inventory Assemblies, which AmeriSync does support including setting pricing. It is treated like a regular item. If you have found the URL to be correct (you can test by browsing to it should pull up the AmeriSync webservice page) the next step is to check the username/password combination. If you require further assistance please let me know in your support ticket or by calling me direct (my number is listed with my initial reply).